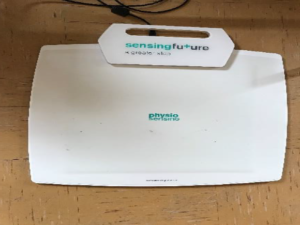 PHYSIOSENSING is a portable scale and pressure platform with visual biofeedback technology for physical rehabilitation. 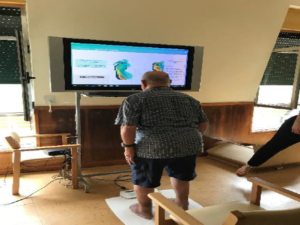 It makes it possible to evaluate balance on several levels, to promote load transfer exercises, to evaluate the distribution of natural load and to perform a large number of therapeutic exercises. SENSING FUTURE TECHNOLOGIES is a Portuguese company from Coimbra, specialized in designing, developing and implementing medical technology. – Measure the acceptability of the product by caregivers and elderly people. – To know the tolerance level of the patients, being able to adapt the exercises according to the degree of difficulty and demand. – Measure the clinical practice of physical rehabilitation professionals in an objective and quantified manner in a clinical report. The pilot was done at the Aita Menni Hospital in Mondragon Basque Country, Spain. Five elderlies participated and they were accompanied by their reference doctor, 2 therapists and a team of psychologist from Home Care Lab. – During the month of February 2018, the preparation of the pilot was organized with the professionals who were going to participate such as the doctor and 2 therapists of the hospital. The idea was to know the device and distribute the tasks that each person was going to take care of along the pilot according to their role with the participants. 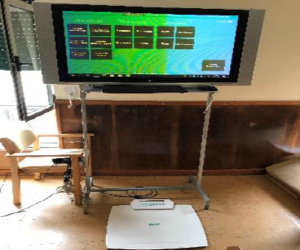 – During 1 month, the elderly could use the portable scale and pressure platform to perform their physical rehabilitation exercises in the sessions scheduled by their referring doctor. – In April 2018, all the professionals met to discuss their experience of using the platform. We work on what they like, dislike and which improvement they can suggest, and ask them about market problems and improvements to the device, which may be relevant to the company that makes them. At the end of the pilot, all participants were interviewed individually. In October, the analysis report of the experimentations will be disseminated to the companies and the partners in the project. Indeed, we did around 20 pilots with 11 companies in SUDOE Territory.